As the summer wound down in 2011, so did tweets about the plastic bag ban. 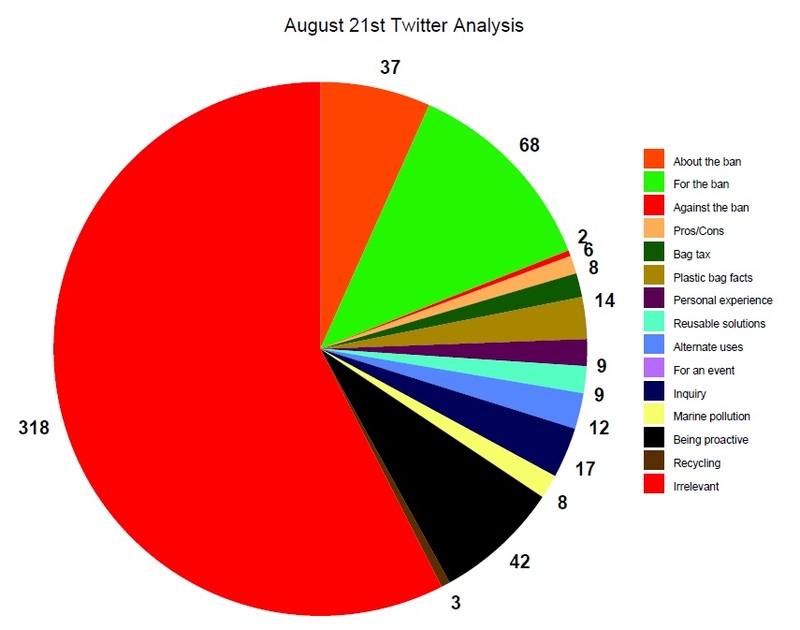 In June and July, there were more tweets about general information versus irrelevant, yet August held its own with tweets for the ban and tweets advocating being proactive. Because of random user @bythe95, who seeming reached out to her entire followers list, a petition from the UK to ban plastic bags was going around Twitter on August 21, 2011. After plunging into @bythe95’s internet information, I have gathered that some TV show convinced this England-native to spearhead her own plastic ban efforts. One of the ways she got the word out was through Twitter. Let this be a note to all activists: Twitter can help! and don’t be discouraged by the slow start. This user, just by mentioning all her followers, got other random users fired up about signing a petition in England. Pretty cool stuff! Another article got a lot of tweet coverage on August 21st as well: “Is The Battle Against Plastic Bags Gaining Any Ground?”, published by Greenbiz on August 20th. This article explains how environmental causes usually gain momentum, and eventually die down in a few months or years after the plans start and the people are convinced. The Greenbiz writer, Leslie Geuverra, is amazed, however, how the plastic bag movement has not lost momentum, and perhaps has gotten a lot easier as time has gone on. Through her interviews in the piece, she explains that since the issue has become more widespread and people are hearing about it, more people want to be proactive. And let’s be honest.. the plastic bag ban is possibly the easier environmental cause to get behind! Once a ban is instated in your area, you HAVE to bag your groceries/purchases with reusable bags, unless you want your merchandise rolling around in the back seat of your car, that is. So there is one message here that I have been trying to portray all along: THE PLASTIC BAG BAN IS EASY. Through my communications courses, I have learned the importance of convenience to Americans. Yes, it is INCONVENIENT to bring your own bags into the supermarket, but if you are left with no choice and the ban has been put into place, you have no choice but to buy reusable bags and bring them with you. Even though in the beginning, the ban had inconvenienced you, now it may be a fact of life, and you should just accept it and move on. Once you have moved on, you will see that it is EASY and CONVENIENT to get behind and environmental cause and help mother nature because one day, you will be sorry that you didn’t.